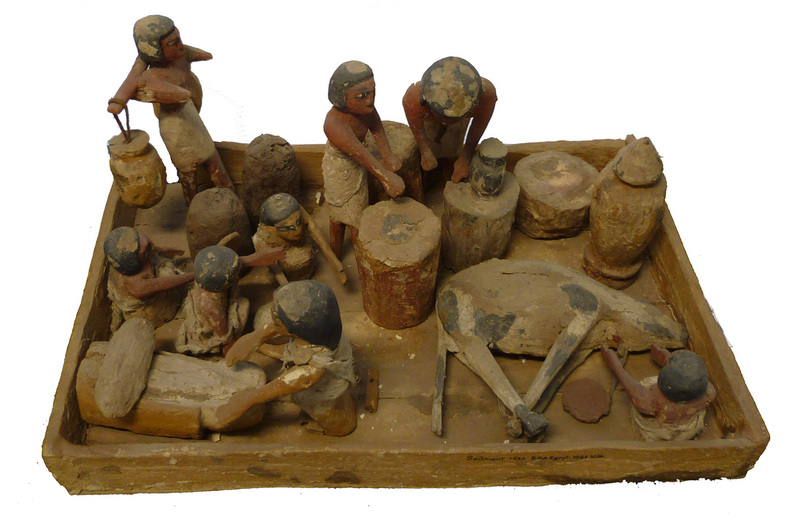 The object is a tomb model of a combination of domestic scenes from ancient Egypt c.2100BC (9th-10th dynasty). The ancient Egyptians believed that burying models of things required in everyday life with the body of the deceased would allow the deceased to access these amenities in the afterlife. This took different forms at different periods, for example in the later periods wealthy people were buried with hundreds of shabti servants. However, in the Old Kingdom (2613-2181BC), First Intermediate Period (2181-2040BC), and Middle Kingdom (2040-1782), tomb models of cooking scenes, boats, granaries, animal husbandry, soldiers and offering bearers were common in tombs of titled families. Tomb scenes on walls of these periods also depict these activities. The activities shown in this model are butchery (at right), milling flour and baking bread (at left), and brewing beer (at back). On the whole, the object was very dirty. Various pieces and fragments of plaster lay on the floor of the model, due to flaking plaster from the figures. Although most of the plaster /paint was still in place, much was in danger of being lost. The base was coming apart at the join of the base boards and the sides. Modern plaster had been applied to the cracks, and AJK dough (see research pages) had been applied to several areas. Breaks on the figures had been mended at different times with a clear, colourless adhesive, or with AJK dough, which had been applied quite liberally to areas of loss/cracks. The AJK appears stable, but its appearance varies from obtrusive to more subtle. Many of the arms on the figures were damaged around the shoulder area. In some cases modern plaster had been applied, and in-painted. All but two of the figures wear net tunics, which were in varying states of repair. In all cases the fabric was still flexible, but very dirty. The conservation record from 1960 states that the wood was cleaned and strengthened with Fibrenyle (Newman 1955), and the paint was stabilised by lacquering with Frigilene, a cellulose-nitrate lacquer. The aim of the treatment was to condition check and stabilise the object for storage. It was thought to be important to dry clean the object as far as possible, and to provide a mount to support the failing base. The decision was taken to leave the AJK in place because it was stable and is known from the treatment of other objects to be reversible for a long time. The object was being prepared for storage so the aesthetic aspect of the AJK was thought to be secondary, and in some places in actually blended in quite well. To increase the stability of the object, it was decided to consolidate plaster/paint and re-adhere detached pieces. All surfaces were cleaned with a soft brush and low vacuum. Surfaces which had been previously consolidated and were judged to be strong enough were also cleaned with Groom/Stick. The net tunics were brushed gently with a very soft brush. Surfaces were mostly consolidated with 5% w/v Mowital B30H in propan-2-ol, and in some places by 1% w/v Klucel G in 50/50 water/IMS. Mowital was used because propan-2-ol was found to be the solvent least likely to remove the pigments on the figures, and it is a good solvent for Mowital, which has also been used on other similar models with good results (Lobaton 2011). However, in a few areas it was found to cause a little staining, in which case Klucel was preferred. The consolidants were applied with brush and pipette. Flooding the area to be consolidated with white spirit before applying the consolidant was found to reduce staining. Detached pieces were re-joined using Lascaux 498HV (an aqueous dispersion of a thermoplastic acrylic polymer), which had been used successfully on other ancient Egyptian wooden objects (e.g. AN1895.153). Arms that had become detached were not always possible to re-adhere because they remained mechanically attached very close to the body by the wooden pin that originally joined them to the figure. These were deemed to be stable enough for storage (although loan would be a different matter), and not treated. David Provan, the mount maker at the Asmolean, was prevailed upon to provide a Perspex stand for the model, which allows it to be moved without risking more damage to the base. Two figures were found in storage that originally belonged in the model, but could not longer stand due to breakage around the feet, and excess AJK in the base. Mounts were created for these two figures by bending thick copper wire into an upright that would provide support around the neck. The bottom end of the wire was inserted in a rectangular Perspex base that the figure stood upon. The wire was painted and shrink wrapped in plastic tubing. The Perspex base was covered in Plastazote in which small holes had been cut to hold the feet and prevent them from slipping.